At General Motors, there was a longtime edict that no car could be faster than the Corvette. A few models like the Buick GNX managed to sneak past that over the years, but in the 1980s Ford had a similar mandate with the Mustang. 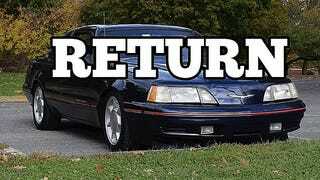 And it kept the Thunderbird Turbo Coupe from being all it could have been. The latest Regular Car Review centers on the latter car, and it goes into how Ford deliberately limited its 2.3-liter turbo four’s engine to make the Mustang better. The Mustang SVO made more power with the same engine, because it was the Mustang; boost was also limited on the T-Bird to keep it from being faster than the 5.0 Mustang. Bummer, because it’s a pretty badass American luxury coupe, and even a decent handler, as Mr. Regular points out. It could have been Ford’s Grand National. Too bad that didn’t happen. It’s better than that lame retro one from the early 2000s, at least.